Gauge: 5 stitches = 1 inch on 4.5mm/US 7 needles. Yarn: Aran weight or heavy worsted weight. I used Tivoli Aran Superwash wool. Needles: 4 mm needles for cuff, 4.5mm needles for body. Sizes: These are designed for putting on over a lighter pair of socks to keep your feet warm in wellingtons. They should fit a leg circumference from about 9″ to 15″. I have put the smaller size – recommended for a snuggly pair of socks for an evening on the sofa – first. The bigger size is in brackets and would be for a man and should accommodate the tucking of one’s trousers into the socks! 10 (12) stitches on Needle 1, 20 (25) stitches on Needle 2, and 10 (13) stitches on Needle 3. If using Magic Loop, you can put 20 (25) stitches on each side. Join in the round, being careful not to twist your stitches. *K 1, P 1 to end of round. Repeat from * until work measures 8cm. Change to 4.5mm needles and continue in the round with st st. Work until leg measures desired length. For proper snuggliness, I recommend 20cm. On the next round, knit until you reach needle 2. The stitches on this needle will become your heel flap. For convenience, you can slip the stitches from needle 3 on to needle 1. Row 1: *Sl 1, K 1, repeat from * to end. Row 2: Sl 1, P to end. Repeat these two rows 9 more times (20 rows total). On next round, knit to end of needle 1. Knit one stitch from needle 2 on to needle 1. 24 stitches remain on needle 2 and these will become your heel flap. For convenience, you can slip the stitches from needle 3 on to needle 1. Repeat these two rows 11 more times (24 rows total). K 12 (14), ssk, turn work. Sl 1, P 4, P 2 tog, turn work. Sl 1, K 4, ssk, turn work. Sl 1, P to within one stitch of gap created by last P 2 tog, P 2 tog, turn work. Sl 1, K to within one stitch of gap created by last ssk, turn work. Continue in this fashion until all stitches have been turned into heel! K across heel stitches. Pick up and knit 10 (12) stitches along the side of the heel flap onto the needle with the heel stitches. 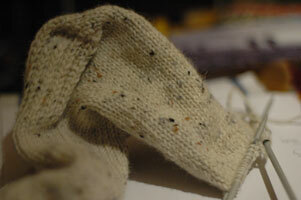 Pick up an extra stitch in the corner between the heel flap and the leg of the sock. This is now needle 1. Knit across the 20 (26) leg stitches. This is needle 2. Pick up an extra stitch in the corner between the heel flap and the leg of the sock with needle 3 and continue on picking up and knitting 10 (12) stitches along the other side of the heel flap. When you reach needle 1, K 3 (7) stitches from needle 1 on to needle 3. Needle 1 – 14 (20) stitches. Needle 2 – 20 (26) stitches. Needle 3 – 14 (20) stitches. Round 1: Knit to within 3 stitches of end of Needle 1, K 2 tog, K 1; K Needle 2; K 1, ssk, knit to end of Needle 3. Round 2: Knit one round plain. Repeat these two rounds until 40 (50) stitches remain. Continue until foot is 5cm shorter than desired length. Round 1: Needle 1 – K to within 3 stitches of end of needle, K 2 tog, K 1; Needle 2 – K 1, ssk, knit to within 3 stitches of end of needle, K 2 tog, K 1; Needle 3 – K 1, ssk, knit to end of needle. Repeat these two rounds until 10 (12) stitches remain (or more if you’ve got big toes!). Be sure there is the same amount of stitches on each needle before grafting each side together.